What do Bill Gates, Oprah Winfrey, and Benjamin Franklin have in common? 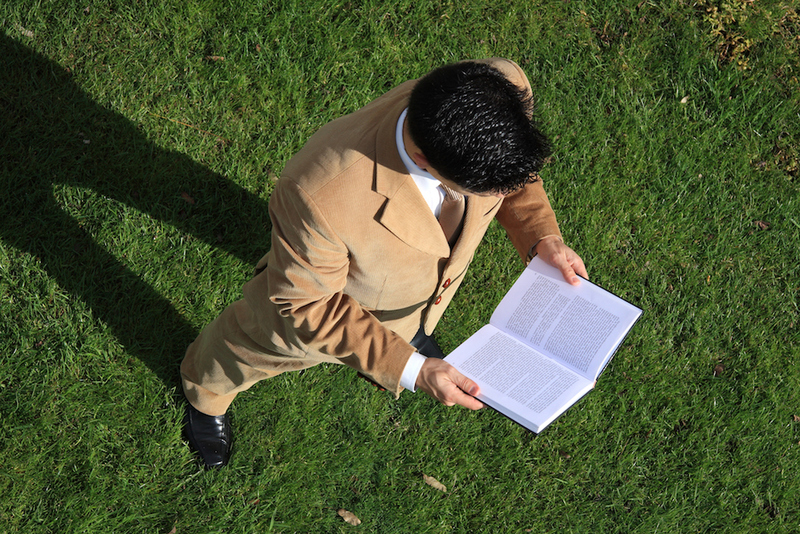 Aside from being innovative thought leaders, they affirm the power of reading. They’re not alone, either. Warren Buffett, Condoleezza Rice, Barack Obama, Winston Churchill, Abraham Lincoln, Mark Cuban, Elon Musk, and Jeff Bezos have shown their belief in the power of pages. I, for one, try to follow the paths of these wise leaders. Living a life knee-deep in complicated predictive modeling and data management, I constantly battle stress and burnout. I have found it necessary to commit fully to reading every single day in order to keep my mind refreshed, disciplined, and creatively engaged. Every so often, it’s also necessary for my company to change business practices. The best way to do that is for me and my team to get ideas from literature. In fact, our insurance company recently jumped into some never-before-tried strategies to cull relevant data points—strategies that came from author insights I had recently read. Feeling the itch to pick up a book, but not sure where to start? It doesn’t matter as long as you begin somewhere. Once you get into a groove, though, it’s important to step away from The New York Times bestsellers list. After all, if everyone is reading “The E-Myth Revisited” and “How to Win Friends and Influence People,” we’re not pushing new ideas and exploring new territory. A word of caution for the short-cutters among us, though: Even though book summary apps are trending right now, they won’t give you the same boost of creativity and innovation as reading books. Although they’re helpful in beginning the idea-generation process, book summaries don’t ignite the same deep cognitive contemplation required with full-length books. For the greatest advantage, leaders must indulge their interests and play on the edge of their knowledge bases by reading books on a variety of subjects. It doesn’t matter which types of books you read—narratives, essays, poem collections, biographies—as long as you don’t burn out or become bored. Learning about other industries, exploring new ideas, and making connections in areas you would otherwise never touch are key to your ability to innovate. In my life, I get a creativity boost from reading about the life and voyages of the adventurer and cartographer Captain James Cook. During Cook’s lifetime, he circumnavigated the globe not once, but three times. How do countless hours reading about Cook give me an advantage as a corporate founder? I learn about essential leadership principles, including consistency, relentlessness, planning, documentation, teamwork, and strategies for continued self-improvement. I follow Cook’s belief in relentless self-betterment so I can keep going even when the wind’s not at my back. Plus, I never settle for stopping after a single victory. When our company originally hit an annual revenue of $1 million, I reset the bar to $100 million to continue the momentum toward a loftier goal. Reading about Cook’s voyages brought energy into my daily life. When I learned about his journeys, I discovered new strategies to overcome struggles in my life and business. It also gave me a little more passion—I looked forward to diving into Captain Cook’s adventures, and I was excited to continue building upon my knowledge. Finding your reading niche will do wonders for you, too. 1. Eat the elephant, one bite at a time. Stop thinking about how many books you want to read, and start thinking in terms of daily pages or chapters. Bill Gates’s reading goal is to knock out at least a book a week. If that goal feels too daunting, that’s okay. Create a plan that feels reasonable—20 pages a day, a chapter a night, etc. Before you know it, you’ll form a habit, and the creative boost you’ll get from reading will become a part of your daily routine. 2. Find small moments throughout the day. The few minutes you have between meetings or in waiting rooms are excellent times to sneak in a few pages. Instead of reaching for your phone to scroll through Twitter, grab a book. (Better yet, have your booked uploaded to Kindle on your phone or iPad so it’s easily accessible.) Your brain will thank you. Stress levels begin to reduce after reading for only six minutes. You’ll be more apt to open a book if it’s handy, so if you don’t have a digital version at the ready, stash a physical book in your car, your bag, your luggage, your work desk, and your bedside table—even your bathroom. If you can read for even longer periods of time, all the better. The optimum time to read for retaining information is early mornings and late at night, so try to schedule longer reading periods at the beginning and end of your days. The experiences of reading the written word and listening to the spoken word are very similar to the human brain. If you want to digest the same information repeatedly, reading might be the better option. And if you want to hear the author’s intended delivery, try an audiobook (think Amy Poehler narrating her own “Yes Please”). Otherwise, do what works best for your reading schedule. As much as reading (or listening) can be a relaxing activity, don’t let your mind off the hook. Read books written by people who are smarter than you are. Imagine you are talking to the author while you read. This can be done in your head or with a pencil in the margins—heck, you can even share your thoughts out loud if you’d like. This kind of engagement with the material will improve retention, spark ideas, and inspire critical thinking. In order to invigorate your mind, stimulate your memory, or kick your curiosity up a notch, look no further than the stack of forgotten books on your nightstand. Give yourself the time and patience to explore topics and worlds through books, and you’ll find benefits in more than just your work day. David Disiere is the founder and CEO of QEO Insurance Group, an agency that provides commercial transportation insurance to clients throughout the U.S. He is a highly successful entrepreneur who has launched business endeavors in the real estate, oil and gas, agriculture, and automotive sectors. He is an avid collector of classic cars, rare art, first-edition books, and Lalique hood ornaments. David is equally passionate about philanthropy, and he works to help underprivileged children through the David & Teresa Disiere Foundation.